Have you ever tried to re-create a dish you had while eating out? I have definitely tried; some were successful some not so much. I do make a mean Crab Rangoon and I love making Pan Fried Chicken Dumplings. There is a recipe from my favorite local restaurant that I order every time we go that eludes me; Lemongrass Chicken with a Caramel Sauce served over Jasmine rice with seared greens. I LOVE the taste and presentation of this dish! I do wonder though if I were able to re-create it at home would the love fade. I don’t think I am willing to risk it; I will save this special dish for when we have date night. This weekend I will be testing a few Asian Fusion recipes that I hope to be able to have a class on soon. I have the ingredients to make Pad Thai and a Spring Roll that sounded delicious with a Thai Chili sauce that I am super excited to see how they come out. My son just came back from visiting his sister in Japan and asked me to experiment with different Ramon dishes. My daughter went to Vietnam over her Christmas New Year’s holiday and fell in love with their street food. Next up on my testing list is Banh Mi which is a Vietnamese Sandwich; she literally tried every different vender she came upon. She also mentioned that I really need to learn how to make Pho which is pronounced Fa. They are definitely are on my foodie radar. 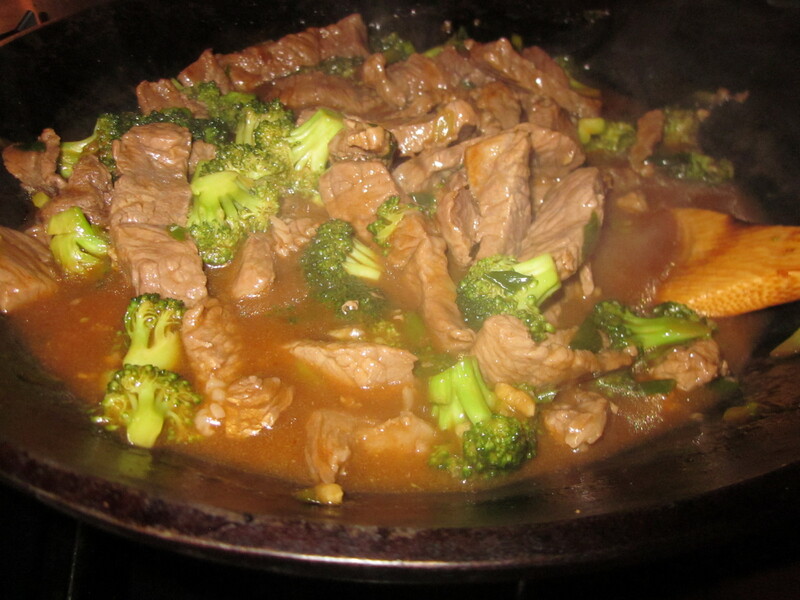 Last night we had some friends over and I made a Beef and Broccoli dish served over Jasmine rice. A couple of weeks ago I tested a Portuguese Paella on a few friends. At least I had made the Beef and Broccoli one other time for my guys and they both really liked it. The Paella was a true test as I have never made before. I always have a backup plan if things don’t go the way I plan. We have like 5 or 6 pizza places in our small town; just a phone call away. This comes together pretty quickly; the rice will take the longest. Unless you use boil-in-bag rice; I did not I just made some jasmine rice, because it is my favorite. Note: pre-measure your ingredients ahead of time and place them by the stove, it will keep things moving along without the threat of burning and over cooking your ingredients. 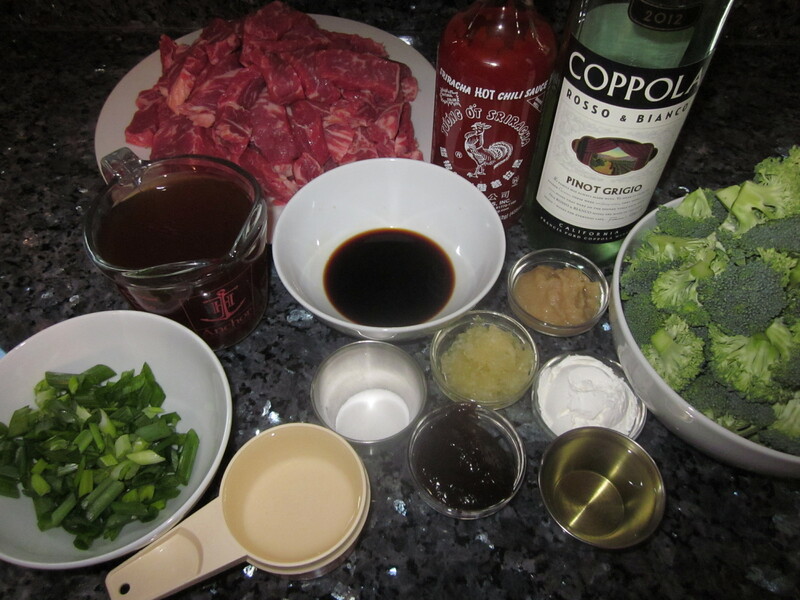 Combine 1 Tablespoon wine, 1 Tablespoon soy sauce, sugar and beef. Stir together 1 Tablespoon wine, 1 Tablespoon soy sauce, broth, cornstarch, hoisin and sriracha. Heat 1 Tablespoon oil in large skillet over medium-high heat; add beef mixture; sauté 3 minutes or until browned. Remove beef from the pan. Add ginger and garlic; cook 30 seconds stirring constantly. Add broccoli and water; cook 1 minute. Add onions cook 1 minute, stirring constantly. Add broth and beef mixture; cook 2 minutes or until beef is thoroughly heated and sauce is slightly thick. Serve over rice.